Pisa and its famous Leaning Tower are just a train trip away from the Cinque Terre. 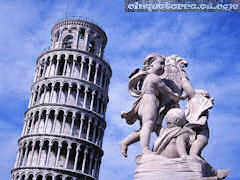 Few tourists in Tuscany wants to return home without a photograph of one of Italy's most celebrated landmarks. But there are plenty of other sights to interest the daytripper. 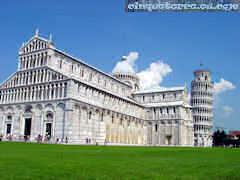 • The Torre di Pisa or Leaning Tower is one of Europe's most famous towers. Building the tower started in 1173 but wasn't finished until the late fourteenth century. The cylindrical tower, 54 meters tall, has eight stories, six of them with open galleries. Inside the spiral staircase has 294 steps leading to the top of the tower. • Il Duomo or Santa Maria Cathedral is located in the beautiful Campo dei Miracoli, next to the Leaning Tower. It is an imposing white building dating from 1063. The facade, constructed in the twelfth century, has four tiers of open galleries housing statues and decorated with marble inlay. • Piazza del Duomo or Campo dei Miracoli, holds the main attractions of Pisa, one of Europe's greatest groups of Romanesque buildings. The key buildings trace life's path for medieval people from birth to death. The piazza was built outside the main city center but within the still-preserved city walls built in 1155. • The Battistero or Baptistery is the largest of its kind in Italy. Like so many buildings in Italy, it was started in one style and finished in another; the first three tiers are Romanesque whilst the pinnacled layer supporting the unusual dome is Gothic and was added in the latter half of the 13th century. • Museo dell'Opera del Duomo has been totally renovated and is located behind the Duomo. The museum shelters many works of art from the cathedral, the bell tower and Baptistery, such as the statue of Boniface VIII, the work of Arnolfo di Cambo, or Donatello's Saint John and Magdalene. • Museo Nazionale di San Matteo is in the former Benedictine convent of San Matteo. Here you will get paintings from the 12th to the 15th centuries, medieval ceramics and sculpture from the 14th and 15th centuries.• Piazza dei Cavalieri was the center of Pisa in its days as a republic and was remodeled in the sixteenth century, becoming the symbol of Medici power in Pisa. The square has some magnificent sixteenth century buildings, the church of Santo Stefano dei Cavalieri, and the Palazzo dell'Orologio (clock building) with two ancient towers joined by an arcade.